Send your little one off to school with a little handmade love….that way they can have a bit of your essence with them all day long. This cute crochet backpack pattern is the perfect choice for a back to school gift. With a matching pencil case, and endless color options, it’s a fun pattern you can count on to make the recipient smile. 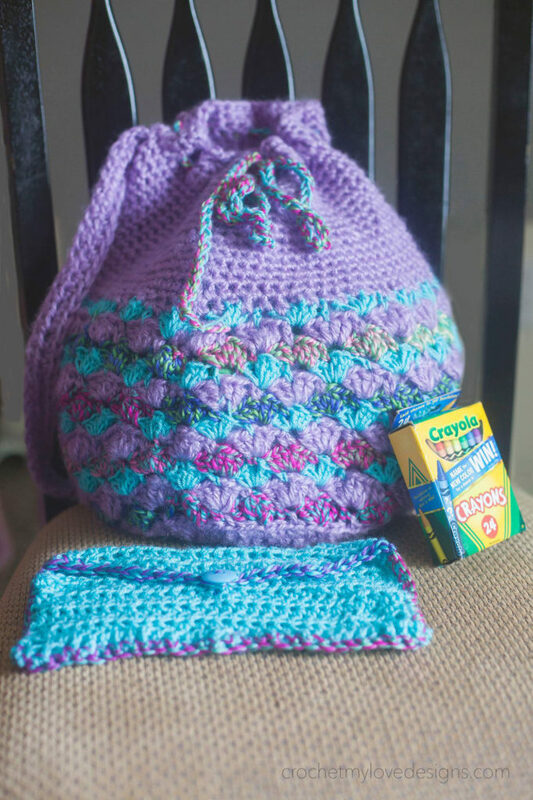 This crochet backpack pattern calls for aran (4) weight yarn and size 6.0mm (J) crochet hook. I have a a great niece that will love this. Melody, this is such a beautiful set! I especially like the backpack, but as a writer and lover of pens and pencils, the pencil case is wonderful too. Thank you for making it free! My neighbour’s little girl is heading back to school in September. I am sure she will like this new addition to her school uniform. Thanks Melody, I have received my pattern. It is much appreciated. Another great pattern! Thank you! Thank you for the free pattern. Looking forward to making it for school age children.